"Where YOUR Personal Design is OUR Speciality"
Since 1961, Sickler Memorials has been assisting our valued clients celebrate and remember the lives of those important to us. Our pledge of QUALITY, SERVICE AND DEPENDABILITY is recognized by our multi-generational customers, where repeat clients are the most flattering testimony to the Sickler Memorial reputation. The possibilities to memorialize your loved one are only limited by your imagination. 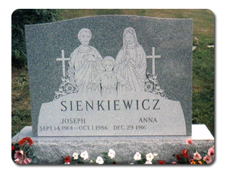 The entire process is approached with great respect and we are honored to try and capture the essence of a loved one’s life on our “canvas” of granite. 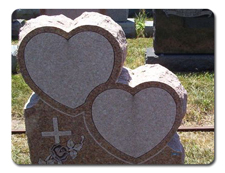 There is virtually no limit to our ability to lovingly memorialize those characteristics that makes your loved one unique. The special memories left behind will be cherished…..forever. A well designed memorial serves as a beacon that makes a statement regarding the loved ones interests, hobbies and passions. We bring your ideas and memories to life and immortalize them forever so they can be enjoyed by generations to come who can reminisce and celebrate a life that was well lived. 152 Oneida St. (607-433-0975) ( Mon., Wed., & Thurs. Noon til 4 PM)).